As my actual birthday was a Wednesday, it was a regular school day so I had school in the morning. But not only was it my birthday, April 25th is also World Malaria Day. Here’s a few facts about malaria: Globally there were over 200 million cases of malaria in 2015 and 438 thousand deaths. 70% of malaria deaths are in children–every two minutes a child dies of malaria. 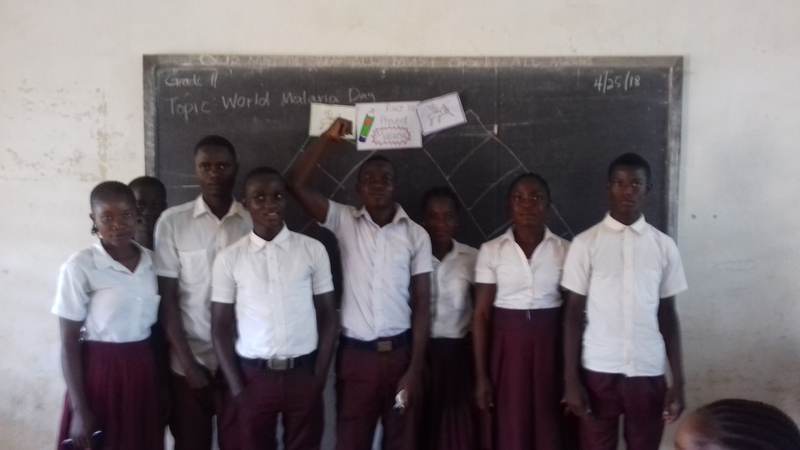 Here in Liberia, malaria is the leading cause of death so it’s especially relevant and what better day to talk about it than World Malaria Day. So instead of having regular math lessons in class, I spent my time with my 10th and 11th graders talking about malaria and playing a game to learn about how to prevent malaria. The game was called “Race to Prevent Malaria” and I split the class into two teams who were racing up their ladder I’d drawn on the chalkboard. The teams took turns drawing cards that had an action on it that determined if they got to move forward. Teams climbed up the ladder if they drew a positive prevention action like “you and your family slept under a mosquito net last night” and “you referred a big belly woman to the clinic” (“Big belly” or pregnant women are at a greater risk for malaria. If a pregnant woman were to get malaria, it could lead to placental malaria which can block nutrients getting to the baby and cause severe complications during childbirth. Pregnant women can receive a free mosquito net and prophylaxis, a preventative treatment, by visiting their local clinic). However, they had to move back down if their action was negative like “you thought you had malaria but didn’t go to the clinic to get tested” or “you have a hole in your mosquito net that you still have not fixed.” I also included a few cards addressing common beliefs that actually have nothing to do with malaria either way. For instance, avoiding plums (Liberian English for mangoes) because you saw mosquitoes on them doesn’t matter–yes, you get malaria from mosquitoes but only by them biting you and transmitting the parasite into your blood stream, not from eating plums! For these cards, teams didn’t move either way. The game seemed to be a hit–the students got very competitive and enjoyed it, and hopefully also learned something too! Continuing my birthday, after school, my friend Patience made me Liberian spaghetti for lunch and one of my students came over to play scrabble on the porch. He recently got a scrabble game complete with a scrabble dictionary but didn’t know how to play. So I taught him and we’ve been playing during recess and after school every now and then too! The only picture I managed to take on our walk… we stopped to buy cold water from one of my students and he had it in this Ohio State cooler! I tried to explain to him that Ohio State is my team just like his football team is Chelsea! To finish my birthday, later in the afternoon, I went for a walk (or as they say here a “walk about”) to a neighboring community with my friend Patience. My school is the only high school in the area so even though it’s a pretty long walk, many of my students live in this community. I’d seen it from the car driving past or just stopping briefly but it was nice to spend more time there and see where some of my students live–and get a reminder of how far they walk to school! Over the weekend, I got to celebrate with some Peace Corps friends in Monrovia! It was another volunteer’s birthday a couple days after mine so a group of us met in town for the weekend. We got to have some of the foods we can’t get at site, like pizza and ice cream! And on Saturday we took a day trip to Libassa, a resort not far from the city, and spent the day relaxing in their many pools and floating around their lazy river! And I can’t forget everyone else that I didn’t get to celebrate with in person… Thank you to my family for my birthday package which was waiting for me at the office when I arrived in town! And to all my friends both here in Liberia and back at home for the birthday wishes! 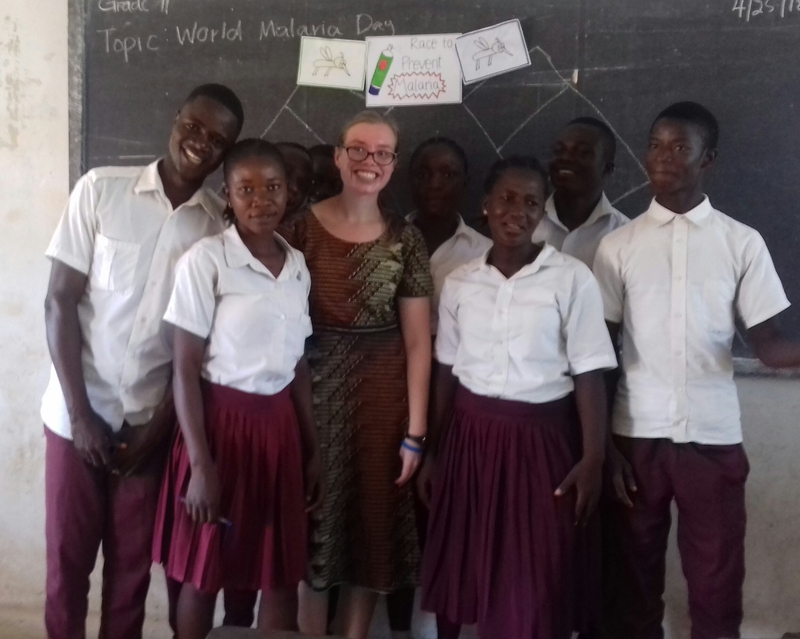 This entry was posted in Africa, Liberia, Peace Corps and tagged education, Liberia, malaria, malaria prevention, Peace Corps, Peace Corps Liberia, teaching in Liberia, World Malaria Day. Bookmark the permalink.